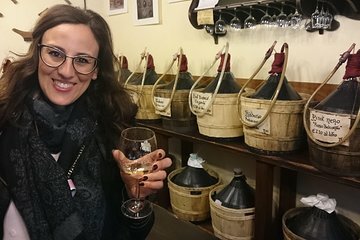 Combina visite guidate con degustazione di vini in questo tour a piedi di Venezia a piccoli gruppi. Visita alcune delle più famose enoteche del canale della città per degustare vini e liquori locali con stuzzichini assortiti. Tra le enoteche, vedi attrazioni come i chiostri di San Francesco della Vigna, l'Arsenale e l'arte di San Zaccaria. Incontra la tua guida in una posizione centrale di Venezia per iniziare il tuo tour di Venezia con wine bar che si fermano tra le attrazioni. Impara dalla tua guida come distinguere le varietà locali dei vini regionali. Scopri cosa rende speciali i vini del Veneto mentre visiti alcune delle migliori enoteche di Venezia. Sgranocchiare i tipici antipasti locali mentre sorseggi i tuoi vini. Lungo la strada, ammira gli splendidi dipinti di San Zaccaria e gli splendidi chiostri di San Francesco della Vigna. Vedi la chiesa dei SS Giovanni e Paolo e molto altro ancora. Goditi l'attenzione personalizzata della tua guida in un gruppo di non più di 12 persone. Guarda alcune delle gemme nascoste di Venezia e scopri tutto sul vino veneziano. Nico was our tour guide earlier this week and we honestly enjoyed the tour so much! He provided us with such a thorough history of Venice and was very knowledgeable about wine. The tour was one of our highlights of Venice and we would recommend it to anyone visiting the beautiful city. Our tour guide was great and had a real passion for her work. There was a grand total of 4 people in our tour which made it extremely fun and intimate. My only suggestion would be to start the tour around 11am as 1030am is a bit early to start hitting the sauce! We had Nico as a guide and he was great!! We really enjoyed the experience...went to 3 places that a tourist wouldn't even know about and walked around an area of Venice that is more off the beaten path so there were no crowds. He gave us some history of the area and discussed the wines we tasted. Thanks for a wonderful experience! Was a great tour and our tour guide Lucia was great she even forwarded photos to us of the whole group. We had 3 couples and everyone got along great. Because it was a small group we got twice as much wine. We had so much food we couldn't eat it all. Would highly recommend this tour to anyone who loves wine. We had a wonderful experience with Veronica! She was very knowledgeable about all things Venetian and was very accommodating with our slower moving group. The wine was great and the food was a great new experience! Loved the tour! I would strongly recommend this tour, especially if you get Veronica as your guide! It was our favorite tour in Italy. We had an absolute blast and the wine and local knowledge were both outstanding! Luisa was a wonderful guide. She took us down mysterious little back streets where we found great little trattorias and wineries and and treated us to wonderful Italian foods. Some foods that we would never had tried if not for this tour. When in Venice!!! She took us to the market place to see where the locals shopped for fresh produce and fish. But the most marvelous surprise was when Luisa came out of a little shop with a beautiful sweet cake topped with candles and a heart to celebrate out 31st wedding anniversary. We loved every minute of the tour and finished way too full of wonderful food and wines and drinks. Thanks Luisa!!! This is a newer tour and we thought it fantastic - and our guide Allesandra even more fantastic. There were only 5 of this on this tour including a really nice guy from Virginia that actually added to the wine information. We had plenty of drink and plenty to eat at these great smaller off the beaten path. We learned so much about wine, Venice and even the food. We had one of the greatest tour guides - you can tell she absolutely loves her job and we loved the tour! Thank you Allesandra! This tour made our trip to Venice ! It is a MUST do!!! Our tour guide was amazing !! She told us so much history about Venice and the tour is through the older part of the city and where the locals live, so you really embrace the town. The tour ended up being only my husband and I and our guide made it very personal. This was the highlight of our trip !